Cold weekend temperatures have descended on just about every location in Maryland, putting an end to any summer plants and many of those pesky insects that were lingering into November. Cold weather is also pushing freshwater and saltwater fishing closer to a winter pattern. This is a time of great transition and great opportunity for those prepared for the change in weather. As one could predict, water temperatures have taken a nosedive in the past week, as low as 46 degrees in some areas of the upper bay. Bait in the form of bay anchovies, juvenile menhaden and river herring are leaving the tidal rivers and headed south. 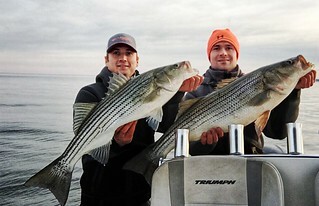 Striped bass are waiting for them along steep channel edges where currents sweep the bait along. The striped bass are also holding on some of the shoals and knolls that can be found between the mouth of the Patapsco and Rock Hall. Jigging in these places has been productive for some impressively sized fish. Soft plastics in pearl or white have been the favorite colors to use. Breaking fish, made up of smaller sub-legal striped bass are being encountered in the mouths of the tidal rivers usually late in the day. The mouth of the Magothy River, the Chester River, the Eastern Neck Island area and Love Point have been great places to troll bucktails without any inline weight. Anglers trolling out in the bay along deep channel edges have been using inline weights to get umbrella rigs and tandem rigged bucktails down to where fish are suspended close to the bottom. The Bay Bridge piers and rock piles have been popular spots for vertical jigging in deep water for a mix of striped bass and white perch. Soft plastic jigs in pearl or white have been standout colors to use. Water temperatures in the middle bay region are about 53 degrees and falling fast. There continues to be a lot of breaking fish made up of small striped bass, but some larger ones are being found underneath by jigging. Soft plastics have been a favorite choice for those jigging. Trolling bucktails dressed with twistertails has also been productive in areas such as Eastern Bay and the region’s tidal rivers. Most are trolling flat lines with no weight in areas of about 15 to 20 feet of water while those trolling along the main channel edges out in the bay and tidal river mouths are using inline weights (again to get tandem-rigged parachutes and bucktails or umbrella rigs down close to the bottom). The lower bay region is experiencing the effects of colder water temperatures and larger striped bass are turning on to the abundance of bait flowing out of the tidal rivers. For example, the mouths of the Patuxent and Potomac rivers have seen large striped bass stationing along steep channel edges, waiting for bait to be swept along by stiff currents. Vertical jigging with large soft plastic jigs has been a very productive way to fish for the larger striped bass. 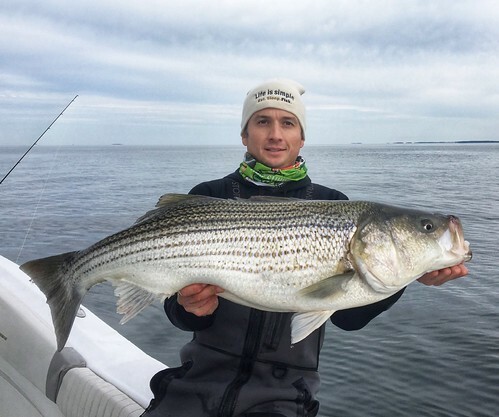 There are a lot of smaller striped bass measuring less than 20 inches in the region and can often be seen chasing bait on the surface, especially late in the day. The smaller fish can provide some fun catch-and-release action for those casting small soft plastic jigs in pearl or white. If you want to break out a 5 or 7 weight fly rod, a sinking tip with either Clousers or Deceivers in a white, silver flash pattern will provide plenty of entertainment. White perch in all regions of the bay are moving to deeper water and they seem to be doing it quickly as water temperatures plunge. Look for them at the mouths of the major tidal rivers in deep water over good hard bottom. 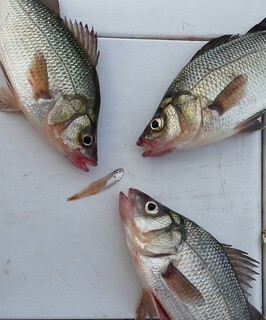 A bottom rig baited with bloodworms is a good bet and a metal jig with a dropper fly works well on larger perch, especially when the larger white perch are feeding on bay anchovies. More upcoming unstable weather patterns from windy, cool weather will continue to drive down water temperatures resulting in bay gamefish continuing their movement out of the rivers into the Chesapeake, and continuing down the bay. Because streams and rivers hold less water and are shallower then the main bay, they will cool first. The larger, deeper main bay waters will take longer to cool providing slightly warmer conditions for bay fish. To prepare for the winter, blue crabs have begun moving towards deeper waters to burrow in the sediment. The Maryland portion of the bay has a well-mixed water column with suitable oxygen conditions and uniform water temperatures from surface to bottom. This will require anglers to expand their search area to include areas typically deeper than they normally fish. As reported from the National Oceanic and Atmospheric Administration (NOAA) buoys, main bay surface water temperatures have cooled down to the mid to low 50s and upper 40s, with the coolest waters found in the upper bay and upper Potomac River near the Woodrow Wilson bridge. The warmer waters are found from the Gooses Reef south to the mouth of the Potomac River. Expect some reduced water clarity from re-suspended sediment in some downwind, nearshore areas as a result of prolonged windy conditions. Expect normal flows for streams and rivers entering Maryland’s portion of the bay. There will be excellent tidal currents conditions today through next Wednesday as a result of the new moon on Saturday, Nov. 18. Windy conditions today through Saturday could impact timing and magnitude of tidal currents. For the full weekly fishing conditions summary and more detailed and up-to-date fishing conditions in your area of the bay, be sure to check out Eyes on the Bay’s Click Before You Cast. Since this is a new feature for Chesapeake Bay anglers, drop us a line with comments or suggestions. Colder water temperatures at Deep Creek Lake means better walleye fishing and there are some nice ones being caught along deep, steep, rocky edges of the reservoir. It is hard to beat the real thing and for that reason drifting minnows down deep along deep grass edges and rocky edges has been very productive. Soft plastic jigs and swim shads are another good tactic as is casting jerkbaits in the evenings. Northern pike are active in the cove areas and can be caught on large spinnerbaits and spoons; crappie are schooling up near the bridge piers at the bridges crossing the reservoir. The upper Potomac River is in good shape this week with good flows and good fishing for a mix of smallmouth bass and walleye. Casting swim shad-type jigs has been one of the best ways to fish for them. Many of the western and central region trout management waters provide good to excellent trout fishing opportunities in the put and take and catch and release areas. Fishing for largemouth bass has been a bit fickle lately, with fronts moving through Maryland. 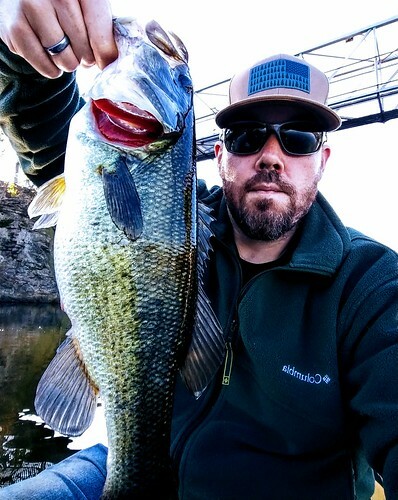 On some days, the best target has been the remaining grass with floating jerkbaits, small lipless crankbaits and spinnerbaits. On other days, hard cover near drop offs has been the place to fish with grubs and craws. Crappie are schooling up near deep structure. Marina docks, fallen treetops and bridge piers are good places to fish for them with minnows or crappie jigs under a slip bobber. Channel catfish are very active in all of the tidal rivers flowing into the Chesapeake Bay and fishing for blue catfish in the tidal Potomac, Patuxent and Nanticoke rivers is very good. There are also flathead catfish at the Conowingo Dam pool and lower Susquehanna River. Fishing for walleye in the lower Susquehanna River has been good. Surf fishing at the Ocean City and Assateague Island beaches has been good for kingfish and small bluefish. Water temperatures are down to 53 degrees so this fishing will not last much longer. The kingfish are being caught on bloodworms and the bluefish on finger mullet and cut bait on floating cork rigs. Colder temperatures should start the fall migration of striped bass from northern waters soon. At the inlet and Route 50 Bridge area the sheepshead are leaving and tautog are filling in and finally some nice legal-sized fish are being caught. Flounder are still moving through the inlet headed for offshore waters, and striped bass are being caught on bucktails, swim shads and topwater lures. 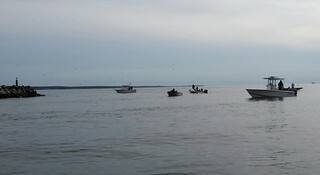 The striped bass action is taking place from the inlet to the Route 90 Bridge area. 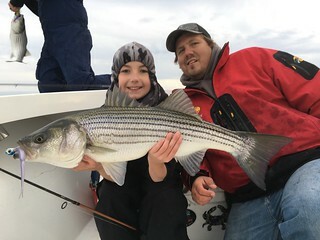 Most of the striped bass are under 28 inches long, but a few keepers are being taken amongst all of the catch and release fun. Fishing for sea bass, tautog, large flounder and triggerfish has been very good at the nearshore and offshore wreck and reef sites this week. Clams and jigs have been the baits of choice for the sea bass, pieces of green crab for the tautog and bucktails or bottom rigs with strip baits for the flounder. 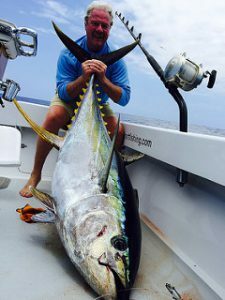 The offshore trolling fishery out at the canyons is just about over. There may soon be some bluefin tuna moving along the 30-fathom line on their annual fall migration from northern waters; recently a few chicken dolphin were being found at some of the offshore lobster pot buoys. 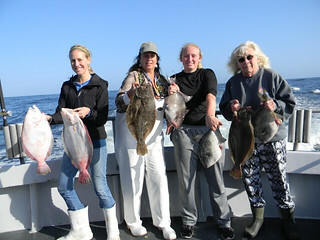 Deep drop fishing is the main show in town at the canyons this time of the year for tilefish. Some have also been finding a few swordfish and one lucky crew bumped into a large opah this past weekend, which just goes to show you never know what you’ll catch when you throw a line over the side. 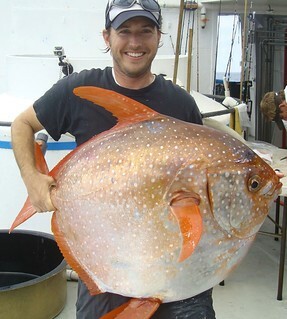 Opahs are a tropical deep water fish that grow quite large, often a hundred pounds or better. According to NOAA, the catch off Maryland last weekend marks the furthest northern range of the species ever documented. Opahs are the only fish species known to have a warm heart and are warm-blooded, they are a prized food fish in Hawaii for sushi and various recipes. “How kind it is that most of us will never know when we have made our last cast.” -Modified from a Nash Buckingham quote about hunting.